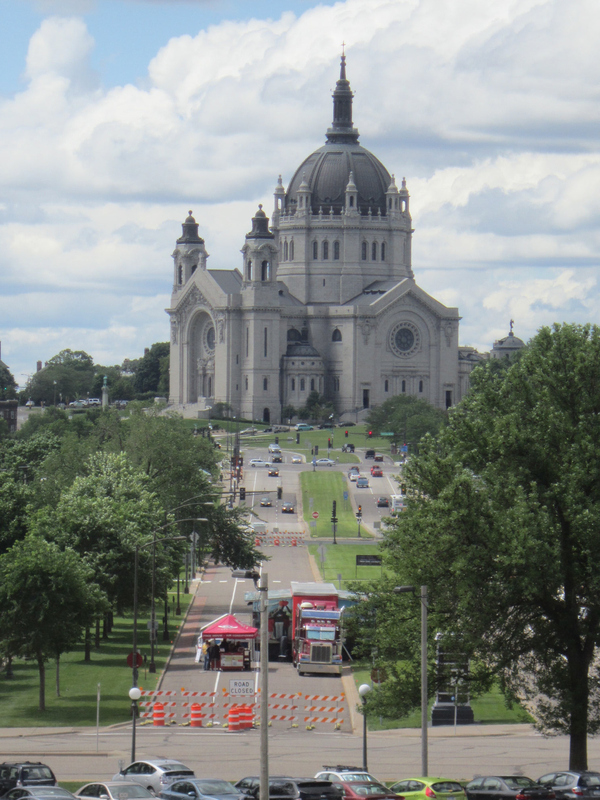 2014 Road Trip Photos #18: Twin City I: St. Paul « Midlife Crisis Crossover! 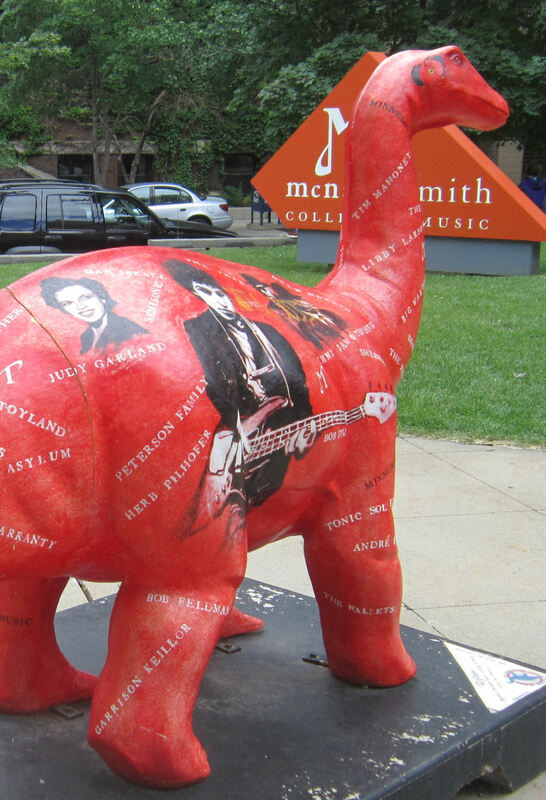 Many Minnesota travelers dream of seeing Prince, but no one would think to look for him on the back of a dinosaur. It’s the perfect hiding spot. Day Four of our road trip was split between each of the Twin Cities. 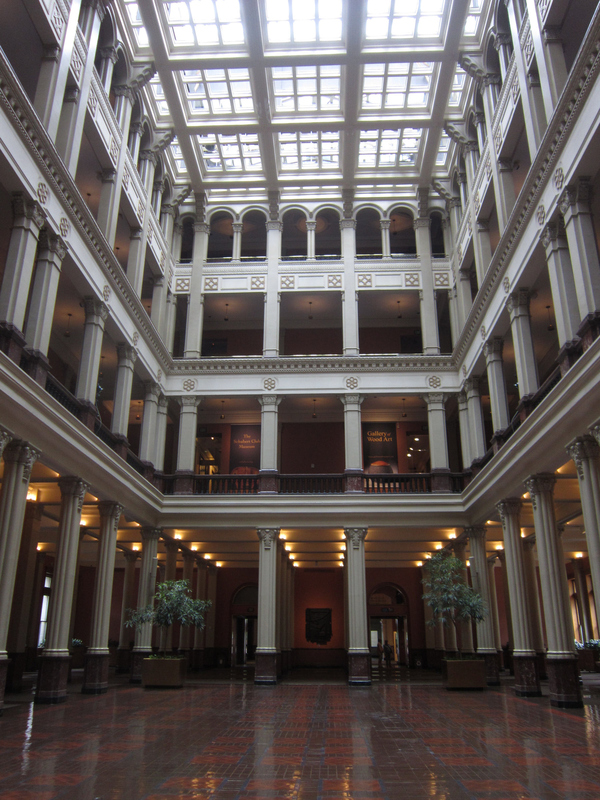 In the morning we’d toured the Minnesota State Capitol and its restricted interior, then ambled around downtown St. Paul, with sightseeing stops in verdant Rice Park and around the grounds of the Science Museum down the street. In between, we found a few other things. Our view of downtown St. Paul as we crossed over I-94 and I-35E. Anyone who’s been following this MCC series shouldn’t be surprised to see our friends the cranes once again. 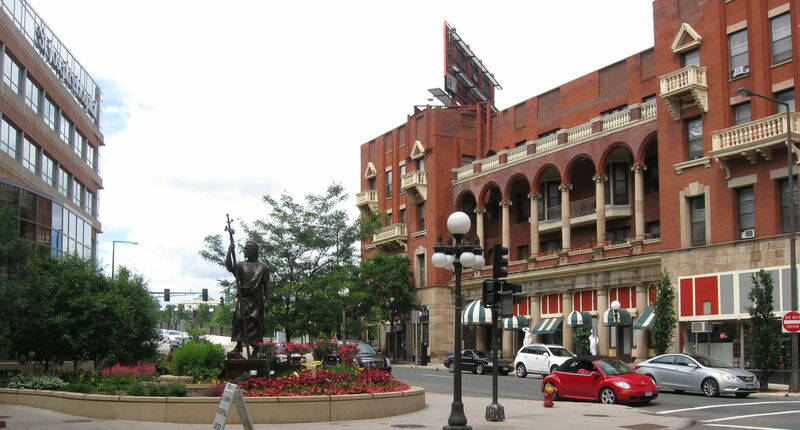 Full disclosure: downtown St. Paul on a weekday wasn’t a nonstop party. Most of the streets we chose at random held offices and non-retail businesses and empty storefronts, including a large, dead Macy’s. Not too far away was the Cathedral of St. Paul, which we’d uncovered in our research but didn’t expect to be quite so gargantuan. Everywhere we look, construction accessories taunt us. The red dinosaur in the first photo stood guard outside a music conservatory, possibly like the one in Whiplash but for smaller children and no self-harm allowed. On my scorecard the dinosaur won the day because it had Hüsker Dü’s name plastered on it, along with several other local acts of varying levels of fame. But Hüsker Dü has long been one of my favorite bands (apropos of everything, my vacation reading for the week was Bob Mould’s autobiography), and it was heartening to see their hometown paying respects. We happened by the school during recess. I hung back and tried not to look or feel creepy while my wife waded into the summer-school playtime pandemonium and captured some of the dino-tattoos for posterity. This was its other side. 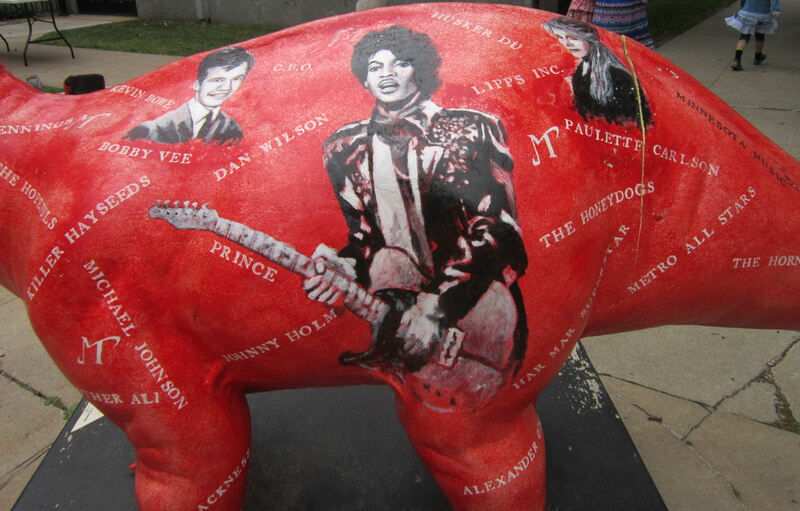 Among those not pictured, the Replacements and a few others were name-checked on the dinosaur’s tail. We had no lunch stop planned, assuming the road would take us wherever we were meant to eat. 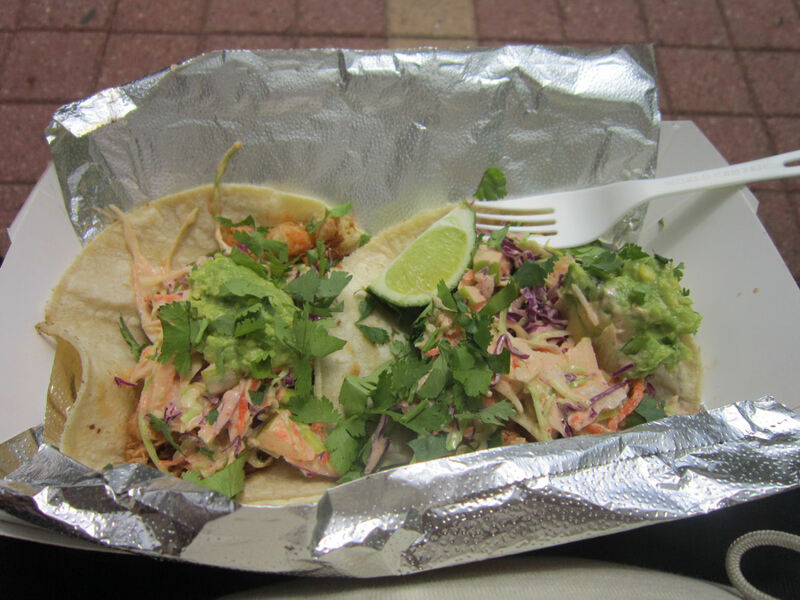 Fortune smiled upon us in one of food’s youngest, coolest forms: a surprise food truck, serving that day outside the Alliance Bank Center at 5th and Wabasha. Nice thing about food trucks: they’re never part of a nationwide franchise or stocked with assembly-line products. If they’re doing it right, with every truck you know the owners and their crew are making you something personal. 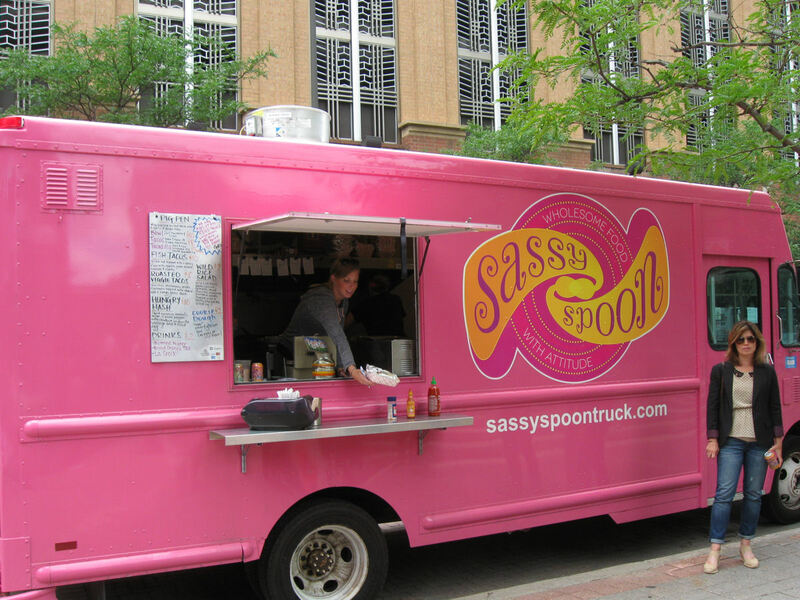 The Sassy Spoon serves specialty tacos. Mine had pork, garlic, and ginger slaw; my wife’s had grilled cod, avocado, cilantro, green onion, spicy slaw, and apple. Both earned 5 out of 5 stars, especially after our long walk from the State Capitol. Thankfully it wasn’t hot outside, but our path so far had been more than a short hop. This is what was left of hers when she restrained herself long enough to snap a pic, and then went right back to chowing down. 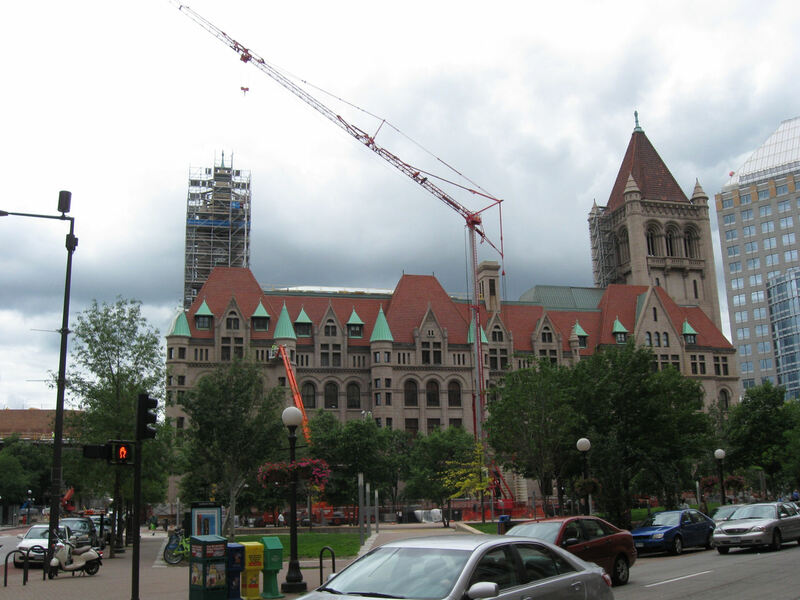 Across the street from Rice Park is the Landmark Center, which throughout its history has served as courthouse, post office, and other state government functions. It’s been on the National Register of Historic Places since 1978 and currently serves as a community cultural center and nifty architectural wonder. The crane is, of course, not a permanent fixture. I think. 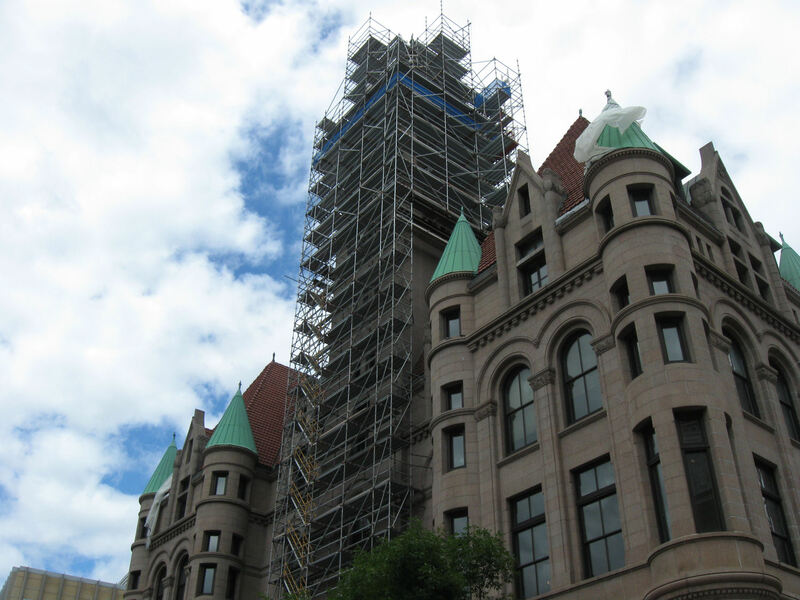 The Landmark Center was one of several structures undergoing exterior renovation during our trip. We should’ve brought hard hats. The five-story Center has a spacious courtyard in the middle, ideal for live performances or gatherings or jousting tournaments or just staring upwards and looking around in circles till you fall down dizzy. 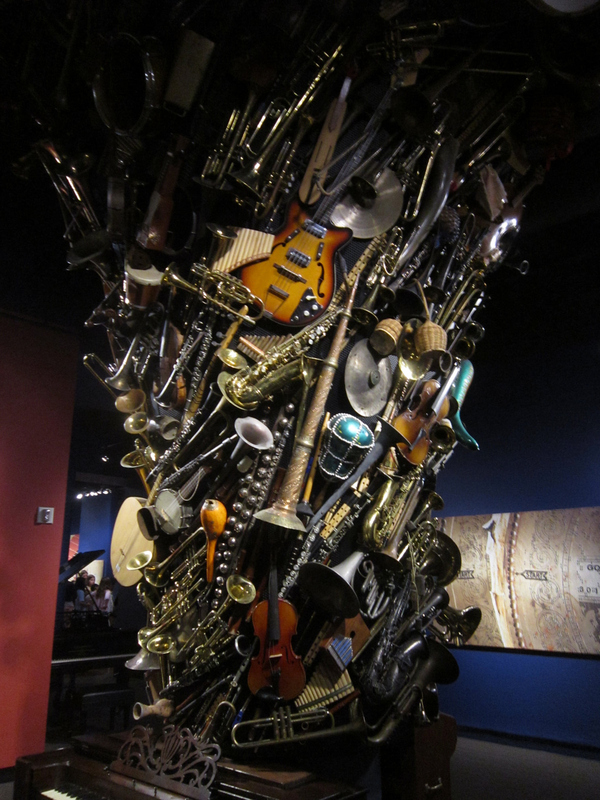 The Center has a couple of tiny museums and public spaces, such as the Schubert Club Museum, whose focus is made clear in its entryway sculpture. 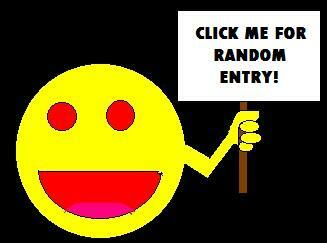 Admission is free, but they’re only open four hours a day. By the time we’d seen all of this, it was after 2 p.m. and we sorely needed rest before our special evening plans. The long walk back to our hotel lacked in attractions, and took us through the kind of neighborhood that doesn’t beckon innocent tourists. At one point we passed a middle-class guy with a clipboard trying to recruit a lower-class guy for a one-day construction job with promise of cash pay at the day’s end. He didn’t bother to ask either of us. We passed one last statue on the way — St. Joseph standing outside his eponymous hospital. He oversaw us in spirit as we returned to our room and, together as husband and wife, passed out. I’m just glad we weren’t wasted enough to need the hospital’s services. To be continued! Next time: our evening in Minneapolis.